The Arnold Palmer beverage is a non-alcoholic combination of iced tea and lemonade, created and made popular by American golfer Arnold Palmer. An alcoholic version of the beverage (generally made with vodka) is often referred to as a John Daly. However, MillerCoors began marketing and distributing a commercially available malt-based version of the beverage under the Arnold Palmer Spiked name in early 2018. In 2012, an ESPN 30 for 30 Shorts documentary was produced on the drink, featuring Palmer, beverage experts, a group of PGA golfers and comedian Will Arnett discussing the drink's history and popularity. 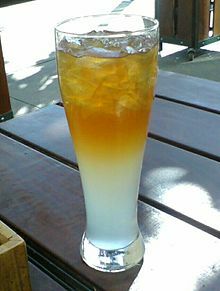 In the film, Palmer attributes the spreading of the drink's name to an incident in which a woman copied his ordering the drink at lunch while working on a golf course in Palm Springs, California, saying “I’ll have that Arnold Palmer drink, too.” Palmer preferred three parts unsweetened tea, to one part lemonade, but when mixed equal parts tea and lemonade, the drink is sometimes called a Half & Half. According to a waitress at Augusta National Golf Club, Palmer ordered his namesake beverage by saying, "I'll have a Mr. Palmer." When Palmer visited the Latrobe Country Club in his hometown, the staff at the snack shack served the beverage to him or his wife, Kit, without prompting. "Mr. Palmer should never have to order the drink named after him." The drink has been sold under the Arnold Palmer trademark via a licensing arrangement with Innovative Flavors since 2001. Arizona Beverage Company began marketing and selling the beverage with Palmer's picture and signature on the bottle in 2002 and has handled distribution ever since. The line has expanded to include various flavors including Green Tea, Southern Style Sweet Tea and Pink Lemonade, Zero Calorie, Strawberry, Peach, Mango and Natural Energy. Lemonade combined with iced tea is also sold without the Arnold Palmer trademark by other companies, such as Nestea, Lipton Brisk, Honest Tea (as Half and Half), Nantucket Nectars (as Half and Half), Country Time, Sweet Leaf, XINGtea, Snapple, and Peace Iced Tea (as Caddyshack). It has 43 mg of caffeine per 23 oz drink. ^ Bamberger, Michael (2005-11-09). This Golfing Life. pp. 181–182. ISBN 9780871139283. ^ Lampe, Ray & Beisch, Leigh. The NFL Gameday Cookbook. p. 230. ^ Spears, Grady; et al. (2009-10-20). Cooking the Cowboy Way. p. 177. ISBN 9780740773921. ^ Kelley, Brent. "The John Daly Drink: Recipes, and Why the Cocktail Is Named for the Golfer". About.com. Retrieved 5 June 2015. ^ "Behind the Beer: Arnold Palmer Spiked Show Promise Amid Early Growth". Retrieved July 30, 2018. ^ "30 for 30 Shorts: The Arnold Palmer". Grantland.com. November 28, 2012. Retrieved July 14, 2013. ^ "The Arnold Palmer Drink". golf.about.com. Retrieved September 25, 2016. ^ "Sidewalk chefs serve up taste of Pimlico". The Baltimore Sun. May 17, 2013. Retrieved July 29, 2014. ^ Politi, Steve (2013-04-09). "Masters 2013: How does Arnold Palmer order an Arnold Palmer?". NJ.com. Retrieved 2018-04-01. ^ Schwartzel, Erich (2016-09-27). "Arnold Palmer, the Humble King of Latrobe". Wall Street Journal. ISSN 0099-9660. Retrieved 2016-09-27. ^ Byrd, Chris. "Tea for Tee". Kingdom Magazine. Retrieved 11 June 2012. ^ "Nestea half and half". ^ "Country Time Lemonade Iced Tea". ^ "Sweet Leaf Half & Half". ^ "XINGtea Half & Half". Retrieved 29 March 2016. ^ "Snapple Half 'n Half". This page was last edited on 18 January 2019, at 18:11 (UTC).